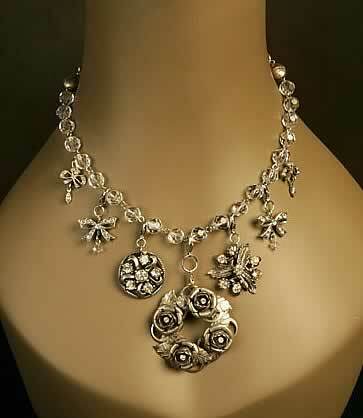 Each unique LuLu necklace has been fashioned using vintage jewelry pieces, evoking a tale of a different time. They tell their stories repurposed to a chapter creating a yesterday that begins anew with today. Rummaging through our mother’s and grandmothers' jewelry boxes is every little girl’s voyage into the future and every woman’s link to her past. How we wanted to grow up … and oh how we love to remember when we weren’t. The brooches, bracelets, and necklaces worn by our mothers and grandmothers are stories to be told. A LuLu speaks to a moment in time. Songs and music of our past elicit more moments of nostalgia, softening the jagged edges of days gone by and bringing dreams of our future. As the features of a LuLu remind us of those moments, it is deserving that each has been distinguished with its own name, unlocking the many senses of our past and bringing hope for our tomorrow. Every LuLu is hand crafted with respect and utmost care for the fragility of the components. Beads of vintage necklaces are individually handwired together. In most cases the backs of earrings and brooches have been removed and the area filed smooth. To prepare the pieces to attach to the necklace, I may drill, solder, glue, or use epoxy to secure the jewelry pieces. I research marked (and unmarked) jewelry and include any information I can gather about the jewelry, to include approximate year it was made. I name each LuLu with a song title of the 1970s or earlier. Then I wear it, in public, to be sure that the components hang properly and all is secure and ready for you. I attach a label with the LuLu name - tags made of old milk carton plastic. Even my business cards are printed on recycled paper. Be it the faded color of a stone or the marring of a 1930s brooch, the dust of time fills in the character, the history, and the mood of each piece. …if they could only talk!